We all love entertainment; it brings us joy, fills us with cheer, lifts our mood and gives us happiness and fun. You can find people all over the globe glued to their TV sets anticipating or watching their favorite TV shows, Movies, TV series, music channels, documentaries, sport channels, education channels, and the list is endless. This several programs give viewers satisfaction in their various ways. Nowadays, people are occupied with their phones or any mobile gadgets, it is the latest trend and sometimes when we are not anywhere near home and out of the reach of our TV we reach for our phones because it’s the quickest way to get entertainment. The mobile phones or gadgets being so portable and can fit into our pockets or bags and provide us with features such as surfing the net, texting, gaming, taking photos, recording and watching videos and so much more. One of the most blissful things about the mobile phones is that it can connect us to the internet and with that comes a whole lot of opportunities and one of those includes using our phones as a secondary TV where we can watch all our shows on different channels. Below I’m going to list 10 Best Android Phones TV Apps to watch all our favorite Live TV shows, Movies and live sports streaming anywhere, anytime, any day. Some of these TV Apps will require you to have access from your supported TV content provider and most do not stream the TV shows, series, movies or sports from their servers but instead search web directory to stream TV channels online. 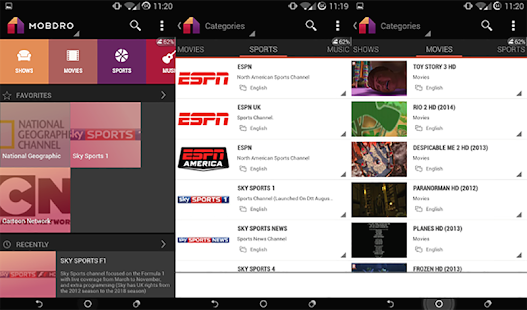 Here are 10 Android Phones apps that support live stream of TV shows, Movies and sports for free. Mobdro is by a stretch the most popular live TV App for Android gadgets. 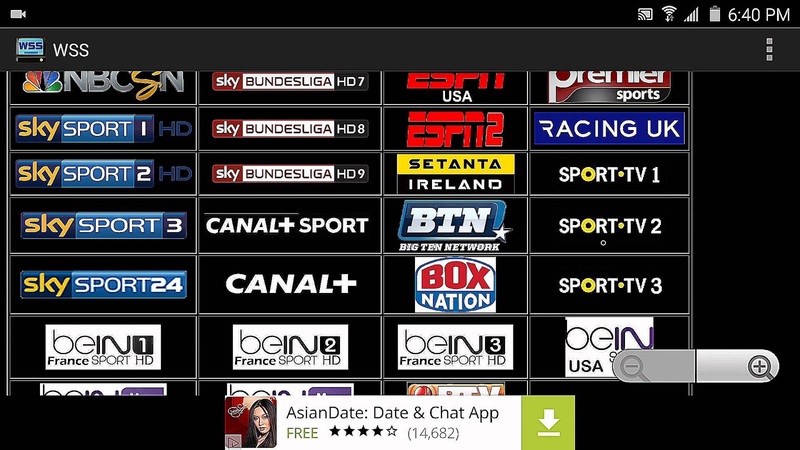 If you need to stream free TV channels the first recommendation by most Android users is to get Mobdro. Developed by Pham Toan, it is a multi-faceted live TV App in that it showcases more than just TV shows or sport channels. It has categories which includes genres such as Movies, Tech, Sports, Gaming, Anime, Spiritual and much more. It is also a beauty in that it offers the download option for popular TV shows. 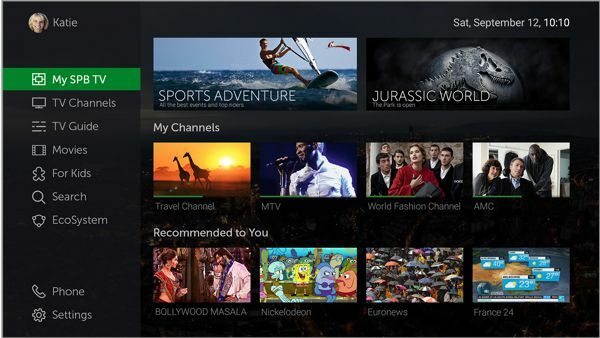 Mobdro provides TV channels in more than 30 languages. It has a friendly user interface with easy navigation. You can also search for programs across the different genres and even favorite them so you can access it easily at some other time. Mobdro doesn’t require you to have any login account. 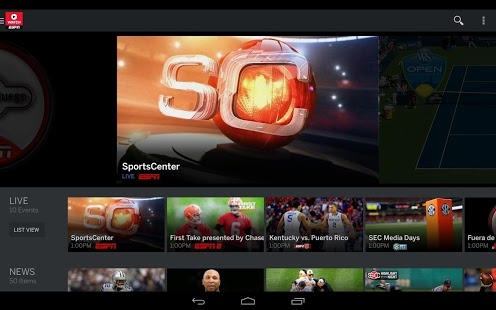 ESPN is a live TV App to strictly stream live sport channels for free on your android phone. ESPN being the world‘s largest sports broadcasting network provides users with fast access to scores from Football, Cricket, F1, NBA, NFL, Tennis, Golf and more. It provides live stream of various sports in various sports competitions in HD video quality, it requires you signing up and logging in to get access to the complete live stream feature package. You can also get game replays, and video highlights. Crackle provides strictly Movies and TV Series from Sony pictures. It is absolutely free and you can watch the content they provide without paying a dime which is why it’s a must get App for Android phone users. It is free to get on the Google Play Store but they have some slight limitation as it does not provide the download option for its expanding viewers. Its free wide range of movies and TV series can be interrupted by advertisement pop-ups but even at that the video quality are high definition and the app has a friendly UI and simple navigation. As the name implies WSS is an Android App used for streaming all the best and latest sport channels online. But it doesn’t stop there because as a bonus WSS provides viewers with some Sky movie channels, talking about killing 2 birds with exactly 1 stone. It offers real-time streaming, availability of all sports event schedule, a smooth streaming experience, different streaming quality and a user friendly interface. Packed with over 300 channels you might sometimes need an MX player app to watch streams on it. SPB TV is a free Android phone App that offers about 200 channels in about 17 different languages, you get to watch news, sports, movies and live TV shows for free without even signing up. SPB TV wide selection of TV channels comes with great user friendly interface that provide onscreen controls and social sharing. You can configure it to get current and upcoming TV shows notification. It has a fairly fast streaming service that doesn’t keep you waiting for long and an option to favorite channels for quick access. Looking for a cool sport App, Sport TV is a great on. It is a free Android phone App that lets you watch your favorite sports live and on demand. Viewers can get to watch sports games from Europe to the Americas and Asia as well as Europa league, Champions league and World cup football matches all for free and there’s no reason to register. Sport TV only broadcast these sport channels in English language but it is still a great free android phones app, users ought to get for streaming live sports and TV shows for free. 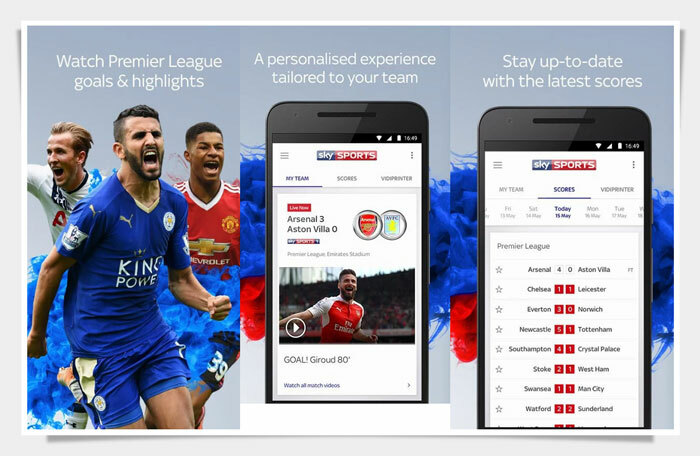 Sky sports, another giant sport company that provides an Android phone app for live stream of sport channels. You get to watch Football matches, Tennis, Rugby, Cricket, Golf, Basketball matches, Cycling and so much more. Its free and provide streams in HD Video quality. You could find it on the Google Play Store or you could download the apk from an external source. Genius stream is an android phone App where you can watch live TV shows including sports, movies, series from European, Asian and American countries for free. Most of the channels are available in HD video qualities. Genius stream requires no membership or subscriptions as it is free to use, it also supports is multiple players. Its user-interface is a simple one as well as its navigation. ABC offers popular TV shows, TV series, Movies and has many fans worldwide with several shows like Gray’s Anatomy, Dancing with the Stars and so much more. The ABC Live TV app allows viewers on Android phones to stream episodes on a wide variety of contents they provide. 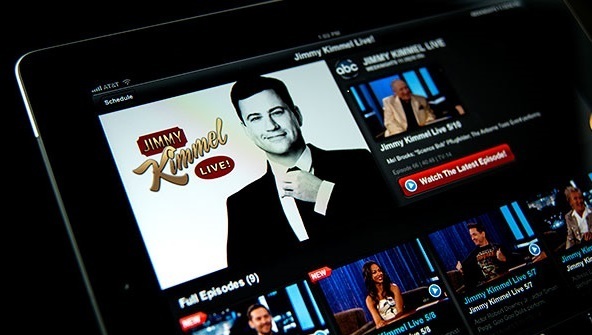 You can also stream entertaining shows like Jimmy Kimmel or watch classics like Ugly Betty. To watch newest episodes you will be required to login with your participating TV provider, if also logged in with your participating TV provider you can stream mainstream events like the Oscars all on your android devices. 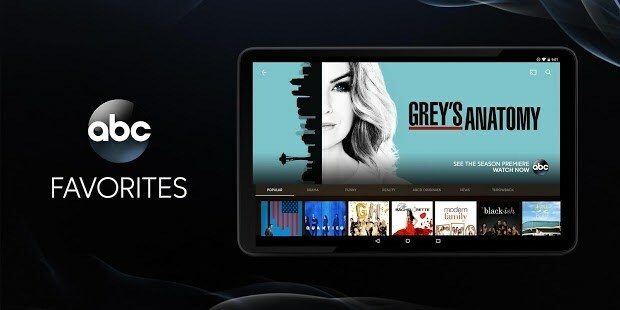 Exodus live TV is another very wonderful android App where you can get to watch live TV shows, series and movies for free. It has a very friendly user interface but contains a lot of pop-up ads which can be frustrating sometimes but the ads can be gotten rid of by paying a small amount. The App mostly streams its content from the US and UK and their channels come in categories such as Sports, Entertainment, Religion, News, Movies and so on. It support HD quality video and still has a low buffering rate and it requires no sign-up. 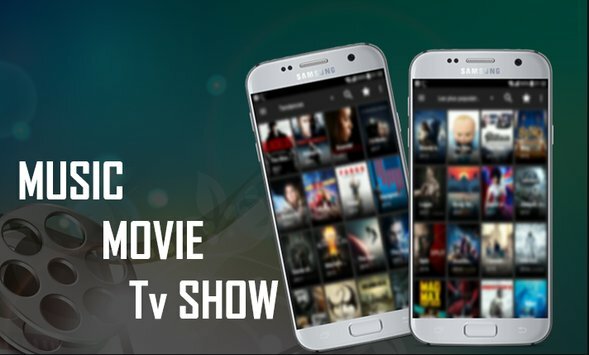 There are a host of lot more Android Apps that provide live TV services but these few listed are one of the best and can be used to entertain you 24/7 no matter where you are. Nice compillation. You might also consider adding iFlix (Kwese TV) to this list as I consider it to fit into your list. I have watched the world cup from the APP. We have both premium and free channels. Sometimes, the popular matches are VIP but there are a lot more free fixings. Also, ALL highlights are streamed for free. The APP was a saviour to me during the just concluded Russia 2018 world cup. Hm... I think i will like ESPN. IFLIX is also a good one.